You don’t have to be Martha Stewart to fashion this charming star-shaped wreath from branches, raffia, zip ties, and a little duct tape. Heather models the finished star wreath. Find additional inspiration with a selection of wreaths created by Chicago Botanic Garden staff in 2013. See this year’s staff wreaths in our Greenhouse Gallery during Wonderland Express. Five heavier red-twig dogwood branches roughly 3/8” in diameter, cut into equal lengths. Heather recommends 30-inch lengths for a front door wreath. You can use shorter lengths to make a smaller star. This will use less plant material and may be quicker and easier to assemble. The base can also be constructed of wooden dowels. Connect the five base branches into one long strand, using the duct tape to create “knuckle” joints: Place the end of the first branch 1 inch away from the top of the duct tape. Position the branch so it covers one-third of the width of the strip. Place the second branch opposite the first branch, leaving a gap between the two branches. Wrap the 1-inch end of the duct tape around the branch ends. Take the longer length of duct tape and wind it around the ends in the other direction. The joint should bend at the gap in the tape between the two branch ends. 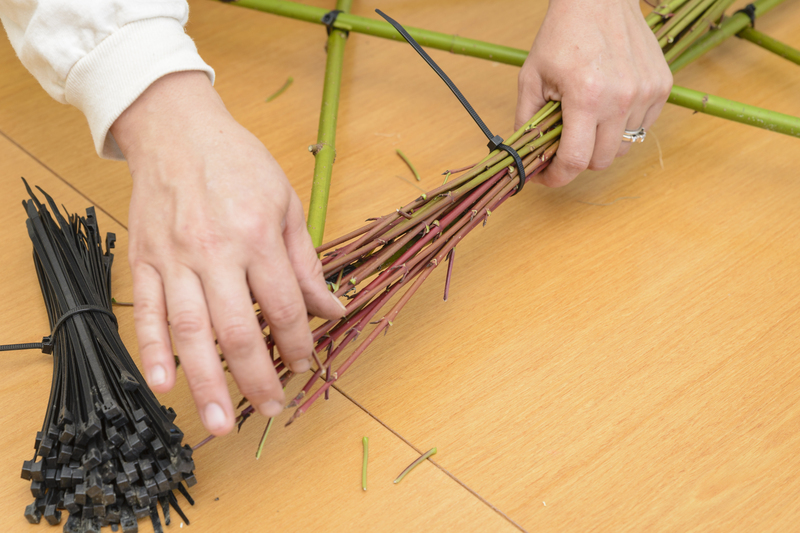 Create three more joints so that the five base branches form one very long, bendy stick. Twist into a star: Hold each end of the long, connected stick and bend the first and last joints, creating a rough pentagon shape. Fold the right side of the pentagon over, then the left side. The base twigs should fall into a rough star shape. Create the final joint in the star: Notch both ends of the last piece of duct tape so it resembles a knuckle bandage. Hold the loose ends of the base sticks together, forming the last point in the star. Center the duct tape under this point. Wrap duct tape ends, one by one, around the point. Check to see that all five arms of the star are level and even. Rotate star to double check spacing of the points. Adjust as needed. 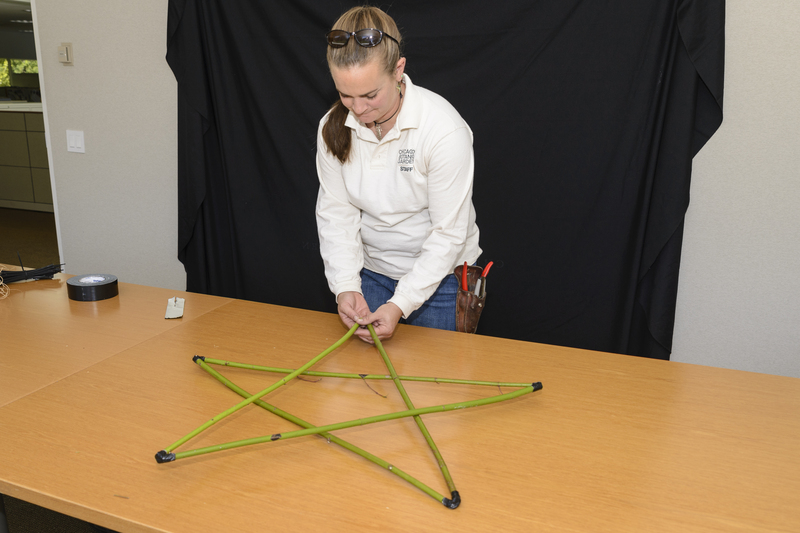 Use zip ties to secure the base: You’ll see that the base branches intersect to create a pentagram in the center of the star. Loosely wrap a zip tie around each of the intersecting branches at each of the five angles of the pentagram, making sure the ties pull to the back of the star. Check again to make sure the star points are level and even. Tighten the zip locks. If you’re using freshly cut wood, remember that it will shrink and lose diameter. When creating the branch joints, leave a gap between the ends when taping them together, so that the finished joint will bend. Hold both ends of the long, bendy stick to create a rough pentagon shape. Cross the ends over to form the star shape; tape the final joint together. Secure the inner joints of the base star with zip ties. You will need the longer and shorter bundles of branches, zip ties, raffia, floral wire, and optional Christmas lights. 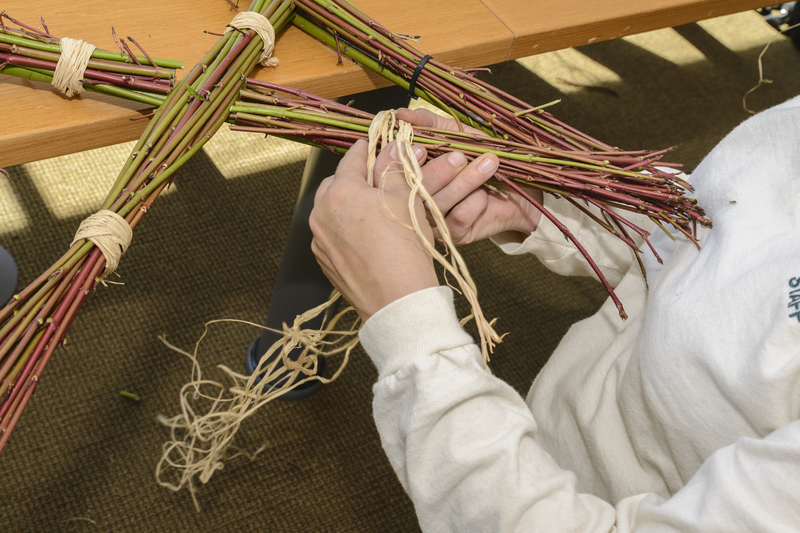 Start with the longer bundles of twigs: Lay the first bundle along a base branch, positioning the cut edges just past the inner edge of the inner pentagram. The uncut edges should extend 2 to 3 inches past the point of the star. “I want the stems to ooze around the base,” explains Heather. Secure the bundle with zip ties at two points, the middle of the pentagon, and the middle of the star point. Make sure the zip ties pull to the back of the work. Continue around the base branches, so that the pentagram and one side of each star point are covered with branches. Secure the shorter twigs. You’ll arrange the shorter twigs in a similar fashion, laying the cut edges on the outside edge of the pentagram with the natural edges covering the star point. Blend the cut edges, to give the star a woven look, and fan out the natural edges to soften each star point. Secure the shorter branches with one zip tie in the center of the star point. Double-check the placement of the bundles. Tighten and trim the zip ties. Cover the zip ties with raffia: Heather has chosen a simple look, tying the raffia in the back with a square knot. You may decide to pull the knots to the front, tie the raffia in a bow, substitute ribbon for the raffia, or add other types of embellishments. Using four to five strands held together, wrap raffia around once and tie in the back. Continue winding the raffia around and around until it completely covers the zip ties and creates a nice, thick band around the bundle. Tie in the back and trim. Continue until all the zip ties are covered. Use floral wire to create a loop to hang your star. Start with longer twigs; uncut edges point outward toward the star tips. Continue placing bundles; one to each side of each star point. Next, position and secure shorter bundles of twigs until the base is completely covered. Cover the zip ties with raffia or ribbon. Knot in back. You can backlight your wreath by securing a strand of holiday lights along the back of the base branches. Lay the strand along the star outline and secure it with floral wire threaded between the base sticks and the stick bundles. Add lights by tying them to the back of the frame with floral wire. For more holiday decorating ideas, consider Heather’s classes on Holiday Lighting Techniques or Winter Containers at the Garden.